January 31, 2019 – It is not only one of the rarest Islamic gold coins, it is also said to be the most expensive one ever to be sold in an auction. On April 4, 2011, the auction house Morton & Eden sold an Umayyad dinar from 723 AD for 3.7 million GBP. Presumably the most expensive Islamic coin in the world: an Umayyad dinar of Yazid II, struck in 723. It is the first coin which mentions a location in the Kingdom of Saudi Arabia. The coin was struck during the reign of Yazid II, the ninth Umayyad caliph. He ruled from 720 to 724. 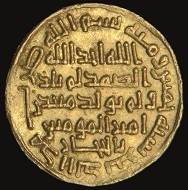 A possible connection of this coin and his haji in 723 has been suggested. 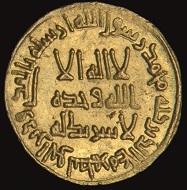 According to medieval writers, the caliph purchased territory close to Mecca at the time this coin was minted and a gold mine was located on said territory. This mine “Ma’din Bani Sulaim” (= “Mine of the Commander of the Faithful”) is mentioned on the coin. It is the first coin which states a location in its inscription that today is part of the Kingdom of Saudi Arabia. As experts, Tim Wilkes and Steve Album were asked to verify this record on January 29, 2019. Tim Wilkes confirmed this record on the very same day. More information about Morton & Eden is available on the auction house’s website. CoinsWeekly published the original press release about the possibly record-breaking sale. Further information about the fascinating history of the first Islamic dynasty is available online.